Deciding where to stay on your family vacation to Disney World can be a confusing concern! There are hundreds of hotel, condo, and vacation home options, and transportation, proximity to the theme parks, and cost are all big components of what will end up being the best place for your family to stay. Take a look at the following “concerns” that many people have when planning a Disney World trip and see which accommodations options best fit those priorities. Park tickets, food, and transportation can get expensive on a Disney World trip, so there are two accommodations options that will help you save money and still have a great trip: 1) Stay in a Value Resort on Disney Property, and 2) Stay in a condo or vacation home off property. Staying on Disney Property in a Value Resort will cost between $60-$100 per night, and will offer your family all the perks of Disney Resort guests. This includes access to extra magic hours in the parks, free Magical Express transportation to and from the airport, and package delivery to your resort. Staying on property also means that all of your transportation is free – no need to pay for travel from the Disney parks back to where you’re staying, as Disney transportation is free throughout property. Finally, as a Disney resort guest, you will have access to booking a Disney package, including dining. These packages can often save hundreds of dollars – especially when Disney throws in all of your dining for free! The second option, staying in a condo or vacation home off property, can often be very inexpensive and can off you a lot more room to move! These accommodations usually offer several bedrooms, a full kitchen, garage, and pool. Making your own meals can mean big cost savings, too! Staying outside of Disney World’s 42 square miles of property can be much more inexpensive than staying “on-site,” but it also means you have to travel and deal with traffic to get into and out of the parks each day. Additionally, one of the best pieces of advice for Disney guests is to head back to your hotel/condo mid-day to take a rest before heading back to the parks; this is tough to do when you’re staying off-property and can easily eat up hours of your day. Consider staying in one of Disney’s 20+ hotels that sit right on Disney property. 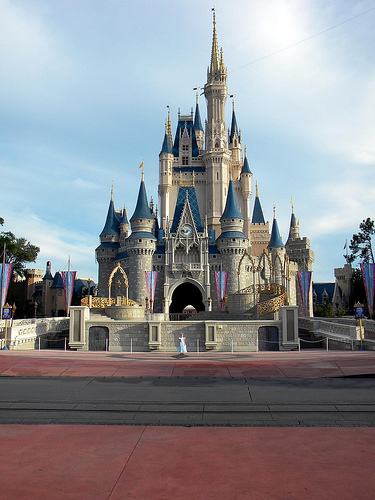 You’re already IN Disney World, so you’re as close as you can be to the “Magic.” Additionally, there are accommodations options that are within walking distance of Disney theme parks. You can’t get closer than that! So, if you have a short vacation or are paying by the day for your park tickets, consider staying on-site. Thousands of people visit Disney World each year to celebrate a honeymoon, anniversary, birthday, or other huge milestone. When you want to stay in the best accommodations Disney has to offer, consider a Deluxe Disney Resort. Disney has three categories of resort properties on site – Value, Moderate, and Deluxe. While Deluxe accommodations will set you back several hundred dollars per night on average, they offer luxury, quality service, fantastic dining options, and that special “magic” that can only come from staying right next to a Disney theme park! I hope this breakdown has helped you to decide where you should stay in Disney World. There’s lots more to discover, but this primer is a great start! Give yourself some time to think about what’s most important to YOU on your Disney vacation, then book your perfect accommodations and enjoy! AJ is an administrator at DisneyWorldBasics.com and truly loves helping people plan their Disney World vacations. For more information about accommodations and hotel discounts at Disney World check out the Deciding Where to Stay in Disney World blog post. For more general information about planning your Disney World vacation, visit Disney World Basics. So many variables make it hard to give advice. But at the same time, newbies can have their vacations ruined by a bad decision.